Stepping on to my balcony to scan the pre-dawn sky I catch the fleeting image of a waning crescent moon as it disappears behind some fast-moving clouds. What I saw was pretty--early morning crescent moons always are--so I wait to see if I get another look. The clouds look pretty dense against the dark sky but after a couple of minutes patch of light appears in the dark and soon the crescent was visible again. This morning's crescent is a delicate sliver of light on the edge of the moon's disc which is darkly illuminated by earthshine. A very light haze gives the sky a soft focus so the crescent's image is gentle stark. The look is suitable for a morning crescent. It holds my interest. I scan the separation between light and dark on the disc. I follow the deep curve of of light and linger on its points, happy just to see this moon and morning sky. The clouds return. Slowly at first, hiding then revealing some or all of the crescent. A brief final tease before dropping the curtain on this performance. 09 October 1978. South of Reed's Gap, Virginia. The mountains are gorgeous on this early fall day. The leaves have started to turn color; patches of yellow and rust dot the forest. A brilliant red or crimson is visible here and there as isolated trees display their fall colors ahead of the crowd. Below the canopy, the woods are a soft yellow and green, alternating sunlight and shadow. Yellows and reds dot the foliage across the forest floor. From my perch I can see the many folds of the Blue Ridge to the southwest. The Shenandoah Valley is to my north, I can see a small sliver of it between the ridges. I bask in the warm sun and experience the quiet. A lone woodpecker knocks intermittently on a tree. Leaves rustle in the breeze. I can hear vehicles in the valley below and the occasional people sound. Good day for a trip. Good day to be alive. At the Speed of Foot was published three years ago this month. I made some marketing effort early on but lack of response and my natural disinclination for self-promotion meant that the entire project has been mostly on autopilot since that initial burst of enthusiasm. The decreasing frequency of posts to this blog are testament to growing inertia. That said, Speed of Foot has met my expectations. Sales have been respectable: 162 Kindle editions and 46 paperbacks. I assume Kindle buyers are mostly strangers. Virtually all paperback sales are to people I know. I've recovered about two-thirds of my costs which is good enough for me. I never expected a best seller. Reviews have been generally good. I posted some early comments from friends. Three of four Amazon reviews gave me four stars. The fourth gave me one star. Reading that review conjured up all the doubts I had as a writer and I knew for sure that my sketches were elementary. But if I had waited for perfect, Speed of Foot would still be a manuscript. Beyond the images, the sketches represent time taken to think and see the trail and its environment. All that is part of the book, some of which I present better than others. Writing the book was an adventure in itself. 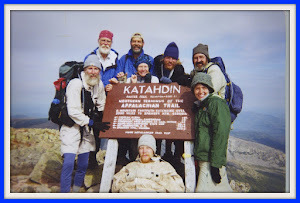 It required as much discipline and frustration as the actual thru-hike. Parts of it had rattled around my brain from the earliest days on the trail. I had always thought that the insights and cumulative experiences would be the focus rather than a south-to-north trail journal but I found that I needed the linear progression to carry the narrative. With more time and effort maybe I could figured out a better approach but I was ready to be done with the project. Except that publication meant marketing. That's where I began this post and will wrap it up there. The simplest way to summarize my thinking about Speed of Foot is that I wanted to write the story, I did, and I am happy with the results.